JAN. MAR. MAY JULY SEPT. NOV.
decrease in feeding in that area. particularly from Texas, are likely to be larger. marketing season may average higher than a. year earlier. may not be equalled for several years, even though sheep numbers increase. smaller than a month earlier but 7 percent larger than in October 1937.
pastures) will be about the same as a year ago. considerably smaller than s-ermed probable earlier in the season. lambs in the eastern dry.land sections of the State, mostly on wheat pastures. heavy movement of l'mb from Texas in I:ovcmbcr nd December. breeding flocks is the largest in some years. in four States: California, Texas, Wyorring, and South Dakota. slaughter for the year 1931-32 totaled 18,648,000 head. year represents 50 or 51 percent of the yearly total. pelt values will be higher in 1939 than in 1938.
other lambs and sheep, particularly from Texas, are likely to be larger. :Thousands Pounds Mil. lbs. Dcllars Mil. dol. ~/ ~Beu of Animal Industry. Ei-cludes Gove~rnment slauhtCr in 1934.
sharply upward in all of the important producing areas from 1923 to 1931.
percent below the peak in 1934.
were reduced the most following the droughts of 1934 and 1936.
areas of the State and also northeastward into the more strictly farming areas. of early lambs to be marketed in the spring months. hay and grass, a moderate expansion in sheep numbers probably will result. for several years, even though stock sheep numbers increase. prices, advances in domestic prices of wool in the corning year will be limited. but about the same as average supplies for the 5 years 1932-33 to 1936-37.
is more than offset by the larger carry-over into the current season. smaller than in the same months last year. 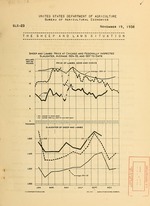 by price advances of 1 to 2 cents per ;rc:.s: pound on most grades of wool. of Agricultural Leorcnics, 7.-.shington, D. C.
:Dol Dol Dol. Dol. Dol, Dol. Dol. Dol. Dol. : 1-.6 : 1937 :average : 19O ept.1938 ct.
/ Bureau of Animal ir.dustry. .